Parvin Covered Bridge, also known as "Lost Creek Bridge," is a little off the beaten path but well worth the drive. Set in a spectacular rural landscape, it has all the romantic charm one desires in a covered bridge. The underside of the bridge is easy to view with a short hike down to the water&apos;s edge. 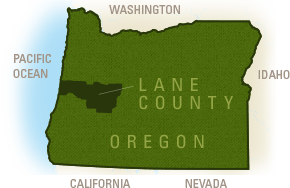 Originally a 66-foot (20 m) bridge spanned Lost Creek, a tributary of the Middle Fork of the Willamette River near the 1880s homestead of early pioneer settlers James and Salina Parvin. He ran a store and served as postmaster for eleven years. He was also active in the Dexter church. Their family cemetery plot is located in Pleasant Hill. In 1917, the first Parvin Bridge failed an inspection when significant worm damage and decay was noted. In 1921, George Breeding constructed an entirely new single lane bridge for a cost of $3,617 nearby. This became today&apos;s Parvin Bridge. The new bridge was bypassed in the 1970s when the road was realigned. For years it was only accessible to pedestrians. 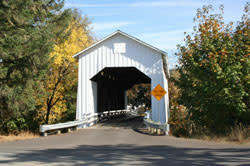 However, a renewed interest in Oregon&apos;s covered bridges prompted Lane County to renovate and reopen the bridge to vehicular traffic in 1986. The granddaughters of James and Salina Parvin attended the re-dedication ceremony. In 1996, OBEC Consulting Engineers installed a new roof, replaced some supports, added new bridge rails, siding and paint. The bridge was raised an additional foot for increased clearance from river debris. 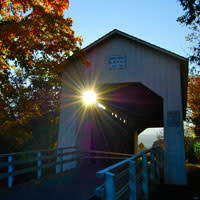 Parvin Covered Bridge, also known as Lost Creek Bridge, spans Lost Creek with a length of 75 feet (23 m). Built in 1921 near Dexter, this white, single-lane bridge is still open to traffic and charmingly romantic. DIRECTIONS: Located southeast of Pleasant Hill, off Rattlesnake Road on Lost Valley Lane.